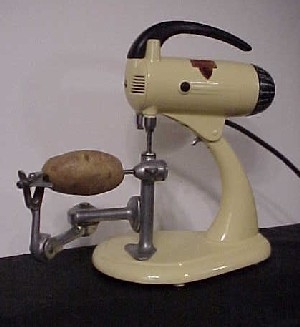 Reconditioned Sunbeam Model 5 with Potato/Apple Peeler in action. It will take a few moments to load and then will run nicely. Designed for MS Internet Explorer. 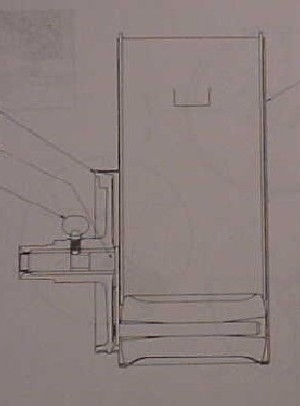 This column contains pictures of the labor saving Sunbeam Attachments. 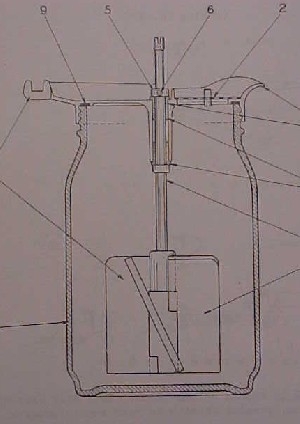 The last picture in the column shows the Potato Peeler in action. Look at all the others first and give the Peeler time to load. 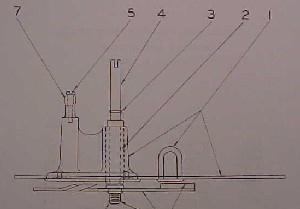 This column contains line diagrams of the attachments. 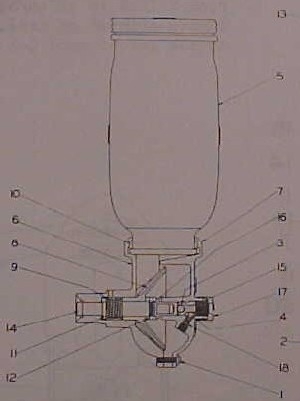 Manufacture dates are under each attachment. 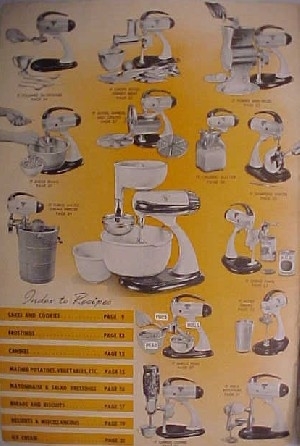 Front page from the Model 5 Owners Booklet showing all the attachments except the blender attachment which came later. Sunbeam Model M4F with the standard equipment. 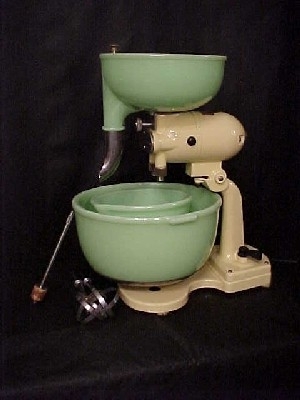 This included: Large Mixing Bowl, Small Mixing Bowl, Two Beaters, Juicer Bowl with Reamer and spout and Oil Dropper Tube. 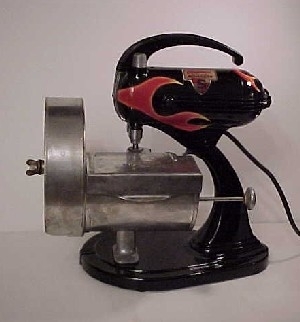 Sunbeam Food Grinder Attachment mounted on Power Take Off unit. 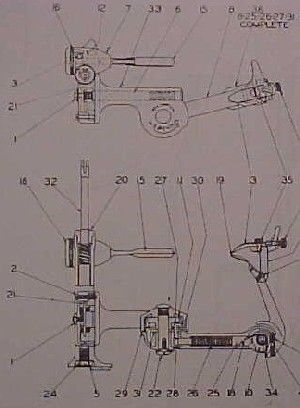 This unit was used on many of the attachments. 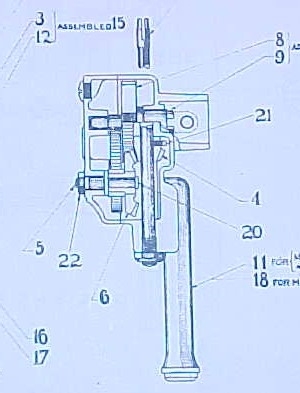 Sunbeam Can Opener attachment, also mounted on PTO. 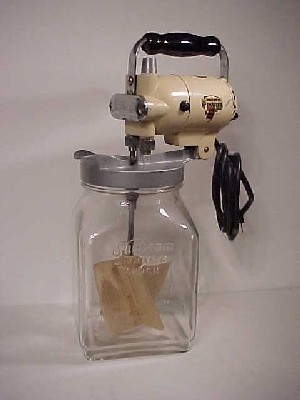 Sunbeam Mixmaster Butter Churn Attachment. This snapped into the beater drive for doing the silverware. Came with a small stick of polishing rouge. 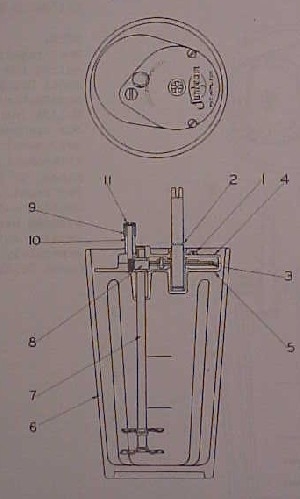 Sunbeam Malt Mixer attachment. 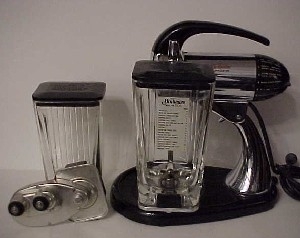 There were at least two different size glasses offered during the life of this attachment. 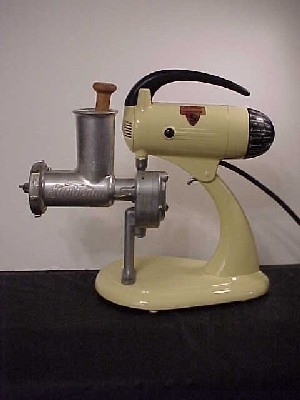 Sunbeam Potato/Apple Peeler attachment. Was driven by beater drive. 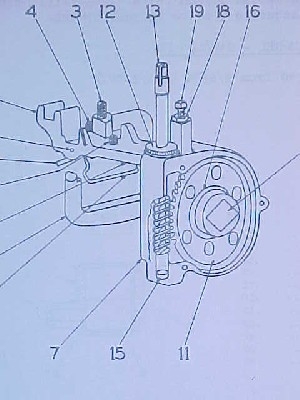 Had its own internal gearing. 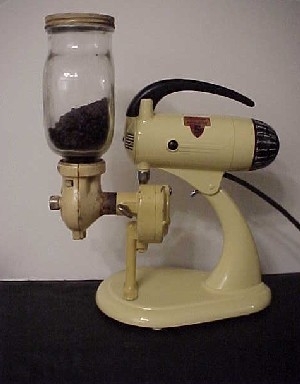 Sunbeam Coffee Grinder attachment. 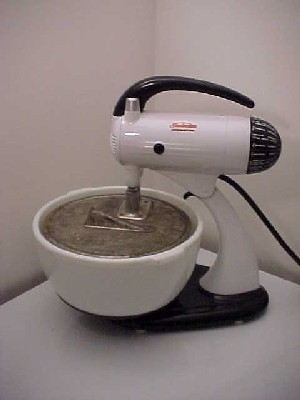 This had adjustable burrs for different grinds of coffee. It used the PTO type drive. 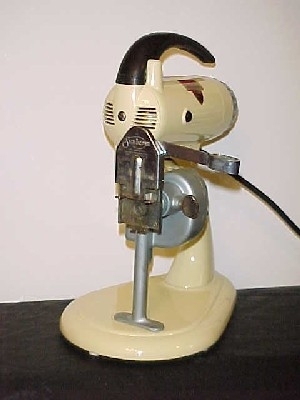 Sunbeam Knife Sharpener attachment. 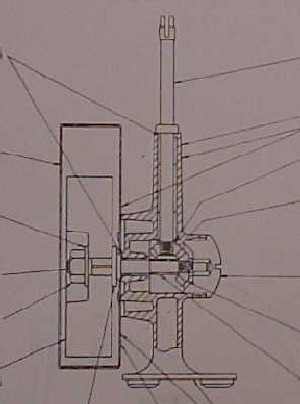 This used the beater drive and had its own gearing. Sunbeam Colander attachment. This was also driven by a PTO unit. It had different sizes screens. 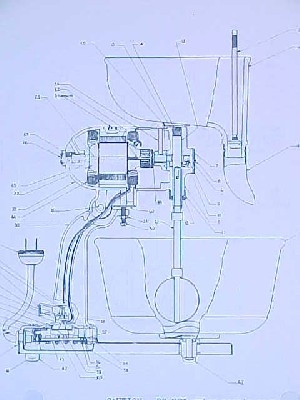 Sunbeam Pea Sheller attachment. Used PTO unit as drive. Used to shell dry peas and beans. 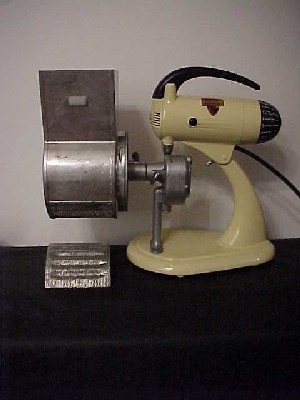 Sunbeam Slicer/Shredder attachment. 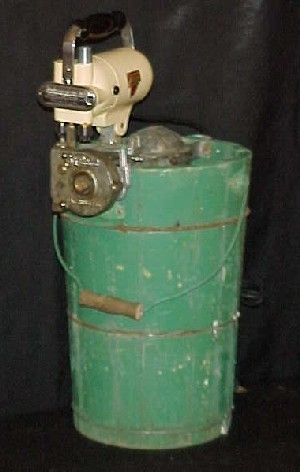 There was also a disc available for grinding ice. 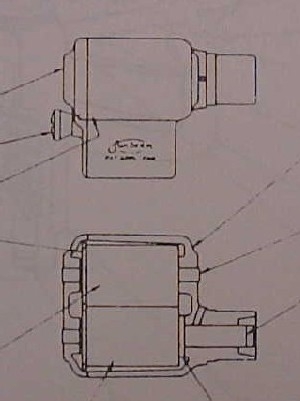 Had its own drive system with built in safety, when door was opened the drive would not turn. 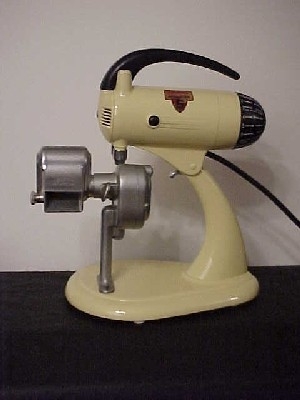 Sunbeam Ice Cream Freezer attachment. 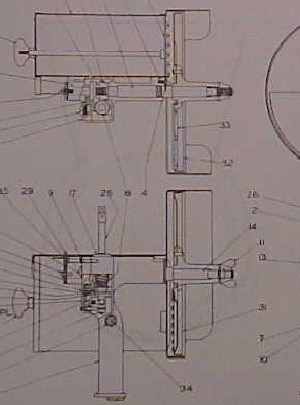 This attachment was offered through the Model 9. 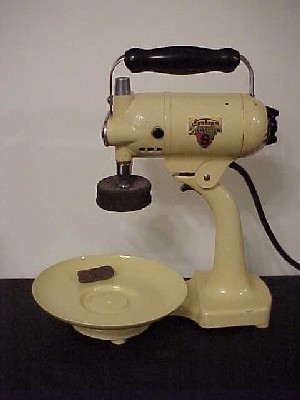 The Mixmaster made the job of cranking the ice cream freezer a thing of the past. No more taking turns cranking the handle, now, everyone could just watch. Sunbeam Bean Slicer Attachment shown with Melinda's Model 9 (late version) Mixmaster ...I finally have the Sunbeam Mixmaster Attachment collection complete, thank you Melinda. 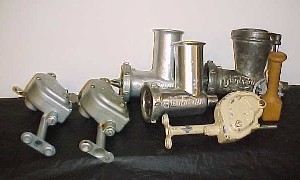 Some of the different types of PTOs and Food Grinders. 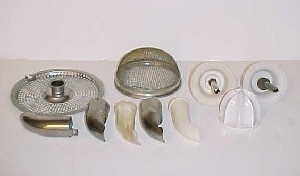 Some of the different types of strainers, spouts, and reamers. 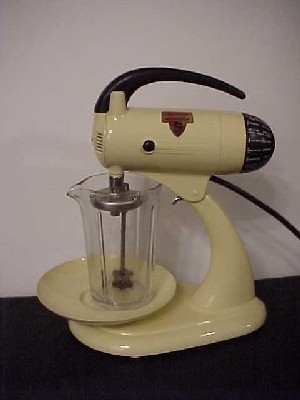 Sunbeam Blender attachment. These were driven by the beater drives and had their own gearbox. Note: There were drives for early and late model mixers. 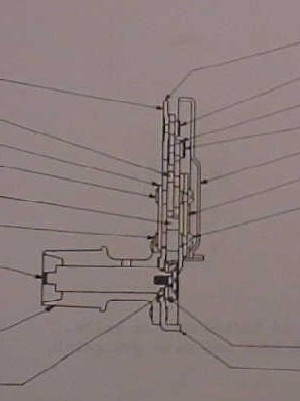 The mounting holes were different on early models (1-9) and late models (10 to 12). 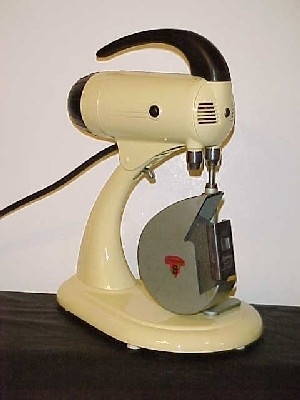 © 2019 DecoDan.com Sunbeam, KitchenAid, and All other trademarks and copyrights are property of their respective owners.